Transition to GST provided for trust based transition of input tax credit of the existing taxpayers. A tax payer could file Form TRAN-1 and avail input tax credit on the basis of closing balance of the input tax credit declared in the last return under the pre GST regime. The last date for filing of Form TRAN-1 is 27th December, 2017. 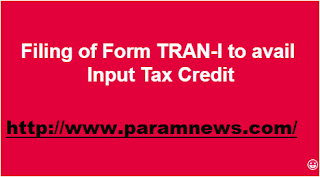 In keeping with the philosophy of voluntary compliance, revision of Form TRAN-1 has also been provided. The last date for revision of TRAN-1 is also 27th December, 2017. It has been noted that some taxpayers have availed extraordinarily high transitional credit of CGST which is neither commensurate with the trend of input tax credit of the industry nor as maintained by the taxpayer himself in the past. Some of these high transitional credits may have a bonafide explanation or may be a case of bonafide mistake. However, it has been noted that high transitional credit has been claimed in many cases for which perhaps no bonafide explanation exists. Analysis to identify such units is underway. Such behaviour leads to breach of trust between the taxpayer and the tax-administration, which is the bed-rock of self-assessment regime in GST. Taxpayers who have claimed transitional credit erroneously are advised to avail of the opportunity to revise Form TRAN-1 by 27th December, 2017 and ensure that only correct and bonafide credit is availed in transition, failing which the tax administration would be constrained to initiate audit and enforcement action against the identified units.